The Golden Age Arcade Historian: What Was The First Coin-Op Video Game to Feature Scrolling? A blog dedicted to the history of arcade video games from the bronze and golden ages (1971-1984). What Was The First Coin-Op Video Game to Feature Scrolling? I'm actually not sure and I'm not going to give a definitive answer for one main reason - I haven't played every arcade video game ever made (something that hasn't stopped others from making definitive claims, as we shall see). Of course, the answer to the question depends on (at least) two things: your definition of "scrolling" and your definition of "first" (I suppose it could also depend on your definition of "coin-op" and "video game" but we won't go there). A debate over the definition of "scrolling" is beyond my scope. It might seem less obvious that the definition of "first" is ambiguous but there are a number of possible meanings - first game "released", first game available to the public, copyright date, trademark date, first game in development etc. Of course, even "released" is a bit ambiguous. By "released" I generally mean when the game was actually made available to distributors for purchase. Of course, games were often introduced at industry shows or open houses weeks to months before this and were put on location for testing even before that. For each game, I will include a brief "release notes" section outlining the evidence I have for release dates. Anyway, here are a few candidates, in reverse chronological order. Not considered the first scrolling game, but the Wikipedia article on side-scrolling video games claims it "was the first game to allow scrolling in multiple directions, both vertical and horizontal". I'm not sure what their definition means to them, but I doubt this. Later on I will discuss another driving game that I think fit their definition that came out much earlier. MAME history file gives a release date of October, 1980. Unfortunately, they don't list sources for their information (someone told me a lot of it came from the game's ROMs but don't know if or where ROMs have release dates). Play Meter's 10/1/84 Catalog issue listed it as being released January, 1981 but that was probably the U.S. release date. No, I don't think Defender was the first game with scrolling - not even close. Others, however, seem to think so. One wikiepedia article made the claim and if you read the Talk notes, the guy who wrote the article got into a kind of whizzing contest with others who claimed he was wrong (it seems he basically rejected all their evidence as "original research" and opted for something he'd read in a published work somewhere - it also seems he had very little knowledge of early video games). Others have made the more modest claim that Defender was the first scrolling shooter (i.e. the Wikipedia side-scrolling article). Again, I'm skeptical even of this more modest claim but the subject of this post is the first scrolling game period, so we'll move on. Play Meter catalog issue and DRA Price Guide both give a release date of November, 1980. The game was shown at the 1980 AMOA show. Play Meter announced its release in the 1/15/81 issue. Vending Times did so in the 12/80 issue. MAME lists the release date as February, 1981. The Wikipedia side-scrolling article says "...an early first-person perspective shooter, featured scrolling in all directions, with the entire screen moving and scrolling as the player moves the cross-hairs". If that is considered scrolling, a number of games did it much earlier. Shown at 1980 AMOA show. By the Space Tactics definition of scrolling above, Star Fire qualifies. I think Star Fire is one of the great forgotten games of all time and one of the most innovative but that's a topic for another post. For the purposes of this post, there were other games that had first-person scrolling before it. Its release was announced in the December, 1978 issue of Vending Times. It was shown at the 1978 AMOA show, which started on 11/10/78. Play Meter catalog gives a release date of September, 1979 but I suspect they are talking about one of the later cabinet variations. A GamesRadar article on "Gaming's Most Important Evolutions" listed this as the first scrolling video game. Personally, I don't even consider it Atari's first scroller, much less the first period. I also find such claims to be a bit amusing and presumptuous. There were hundreds of video games made in the bronze and golden ages (I have over 3,000 listed and that's just coin-op - not counting home games). To claim definitively that something is the "first game" to do XYZ seems rather silly to me, especially when most of the people making the claims don't seem to have played many of the bronze age games - especially not the early ones. My knowledge of the games is far from encyclopedic but even with my limited knowledge, the majority of the "first game to ___" claims seem to be wrong. Its probably best to avoid such flat out claims. As with other Atari games, this date comes from the Atari internal document that has made the rounds on the web. The date is supported by the Play Meter catalog issues (as are the other Atari dates below). It was also at the 1978 AMOA show. Oddly enough, the very next game after Atari Football in the Games Radar article is this one. Maybe they don't consider this a scrolling game. Or, since the list is in (at least roughly) chronological order, maybe they think Football came out first. 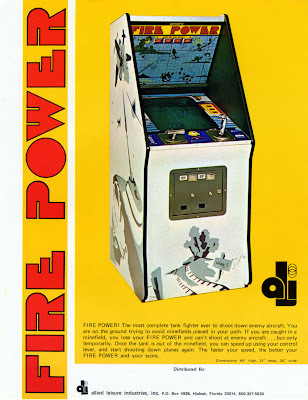 In any event, I consider Fire Truck to be a scrolling game just not the first and, once again, not even Atari's first. There may be some who don't consider this scrolling since it wasn't free form, but I don't see why that would matter. In any event, we still haven't reached what I consider the first Atari scroller. This one had a perspective sort of similar to Sky Raider but in a racing game. The problem I have with this one is dating it. The Arcade Flyer Archive and KLOV give a date of 1978 but I'm not sure of the source and they don't give even an approximate month. OK, now this is the game that I consider the first Atari scroller. If you consider Fire Truck a scroller, you have to include this as well (play them both on Mame and you'll see why - especially when you crash). This one doesn't seem to get mentioned much in discussions of scrolling in video games, but if you consider Rally X to be a scroller, I don't see how you'd exclude this one. Maybe because of the lack of radar or a map? Or because it wasn't free form enough? Another game that seemingly qualifies based on the Space Tactics definition. Another alleged first-person scroller, but I can't tell from the flyer if it did so. If it did, it's a leading candidate for the first first-person scroller. Oh, and if you didn't know, this one was designed by Atari cofounder Ted Dabney, who briefly worked for Meadows after leaving Atari (it was his idea to put the Flim and Flam feature in Flim Flam). Vending Times, Replay, and Play Meter all announced the release of the game in their July, 1976 issue. The wikiepedia video game timeline lists these games as "forward scrolling games". Moto-Cross was a motorcycle racing game - supposedly rebranded as The Fonz. Road Race was car racing. I haven't played any of them or seen a YouTube video but from the flyer, I am not sure Road Race scrolled or not. Dating these games is another issue. Vending Times announced the release of The Fonz in its November, 1976 issue and Replay did so in its December issue but both said it would be introduced at the AMOA show (which started 11/12/76). My notes have a release date of 8/76, but I don't know where it came from. In any event, if it was just Moto-Cross rebranded then the release date of Moto-Cross is more important. Replay announced the release of Road Race in the May, 1976 issue but this was the U.S. release date. The Arcade Heroes website calls this a "vertically scrolling tank game" but I cannot confirm as I haven't played. The Vending Times article on the game's release doesn't give me enough info to determine if it scrolled or not. It was a tank-vs airplane game where you were the tank. Play Meter's 1979 catalog gives a release date of January, 1976. Its release was announced in the December, 1975 issue of Vending Times. Speed Race was designed by Tomohiro Nishikado (of Space Invaders fame). The wikiepedia article on Nishikado says this game introduced scrolling, giving the source as Bill Loguidice and Matt Barton's Vintage Games (I don't have my copy handy to see what their source is). Midway released it as Wheels (though I don't know if they modified it - I don't think they did). Nishikado mentioned the game in a USA Today interview but didn't say anything about scrolling (he did say he thought it might have been the first Japanese game released in America). This one IS available on YouTube (http://www.youtube.com/watch?v=Qc5_UXYFJZo). Some might argue that it doesn't scroll since all they really appeared to do was animate the "grass" strips on the roadside but you can watch it and decide for yourself. There were a number of other early driving games (i.e. Laguna Racer) that used a similar concept. Oh, and in case anyone wondered, Atari's Space Race didn't scroll - you just went to the top of the screen then reappeared at the bottom. Unfortunately, I don't have more precise release date info for early Japanese games. 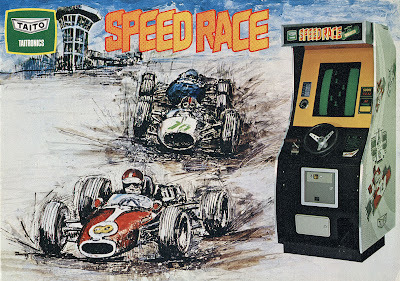 Vending Times and Play Meter announced the release of Wheels in March of 1975 so I'd guess that Speed Race came out in late 1974 in Japan. I would consider scrolling to be anything that involves the playfield being in motion vs. stationary. In those regards Wheels would definitely fit the bill. I always thought of scrolling being where the playfield doesn't fit on a single screen and the offscreen parts "scroll" into view as you move. So Cops and Robbers wouldn't qualify as Atari's first scrollign game to be because even though the lines on the roads move, no scenery actually scrolls into view, the car on either side don't go offscreen, and the car in the middle just wraps around from top to bottom (at least that's the way it looks whem I play it in MAME). I'd be a bit more specific. If a static playfield (not counting things like animated decorations) is used and the player's 'screen' is a window to that playfield then it would be scrolling. If you go from the bottom of a Rally-X map to the top (or corner to corner) then your expectation is that the map will be the same going in the opposite direction then it's being scrolled. A space game would be harder because it would be easy to erase stars when they left the view and then create new ones when they re-appeared. I think few people would notice if the stars re-appeared in the same position that they left. So, if a map is held in memory (or disk, I guess) rather than being created 'on the fly' it would be scrolling. Night Driver would be tricky. If an algorithm was used to determine where the side posts should be positioned, then drawn, moved down, and erased then I don't think I would consider that a scroll. Even if the course ended up being the same every play because of the numbers used in the algorithm or formula. About the 4/5/15 NOTE: I've been visiting this article plenty of times last week, but I mostly come from Google searches. Your site seems to rank pretty high in all the searches I do for 70's games. And it should - it's an incredible resource! I'm currently working on a little quiz game about the history of video game and there is plenty of info I only find here. It doesn't say that Speed Race is the first scrolling game, but only that vertical scrolling was one of its "key claims to fame".